HSSC invited applications for recruitment to 2459 Officer, Supervisor & Other posts. The candidates eligible for the post can apply in prescribed format on or before 15 February 2017. 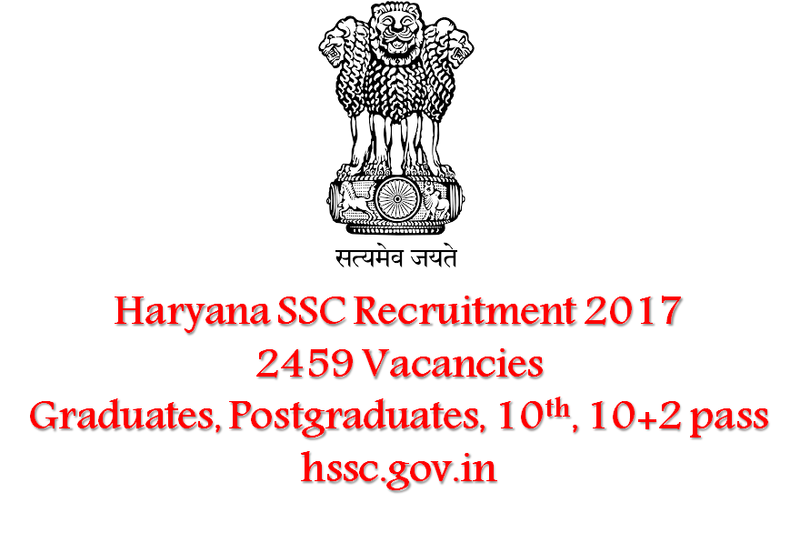 Haryana Staff Selection Commission -HSSC Job Notification: HSSC invited applications for recruitment to 2459 Officer, Supervisor & Other posts. The candidates eligible for the post can apply in prescribed format on or before 15 February 2017. This will be a great opportunity for graduates and 10th pass candidates as majority of the vacancies have set graduation and matriculation as the minimum educational qualification. Posts are also available for postgraduates and senior secondary pass as well. one of the subjects either at the Master's level or if the candidate has also graduated in the Honours school in Mathematics or Economics, then with Statistics as one of the subjects at B.A. Honours School level in these subjects, or a Master's degree in Statistics. ii) One year's experience in collection compilation and analysis of statistical data preferably in some Government office. iii) Hindi Sanskrit upto Matric standard or higher education. For all the posts mentioned above knowledge of Hindi/ Sanskrit up to matric level is compulsory. Interested and eligible candidates are required to send their application online. Detail information can be found from the link given below.